Discussion in 'Vegas Trip Reports' started by slacktion!, Oct 8, 2008. The timing of this trip was interesting to say the least. I work for a certain bank that recently was consumed by another bank and I am currently uncertain about my employment future. In addition the sketch comedy group I perform with had our final performance in a (somewhat) major and important (for us) comedy festival just a wee 34 hours before I was to fly out. All making for a stress filled few days. But luckily the big day of our departure had finally arrived! Our flight was to depart out of SeaTac Airport at 8am on the morning of September 29th. After a round of bloody-maries we boarded our flight and taxied the runway…only to be told we needed to return to the gate due to a medical emergency. After an hour of waiting and a quick refuel we are finally off! After quickly unpacking and freshening up we head downstairs to “Bugsy’s Bar” where my parents are already waiting (they had flown in the night before.) We decided to sit and relax, play some video poker and earn some free drinks. After about an hour we head out. I finished there about even and had around 4 beers. I make the executive decision we need to grab a bite at the oyster bar at Penazzi at Harrah’s. However before we leave, I throw down money on the Ravens (6 point underdog against the Steelers) On the walk over to Harrah’s I notice a few openings at the $5 craps table at O’Sheas. So I sit my fiancÃ© and parents down at the bar while I win around $80 playing craps. Now we head to Penazzi! The four of us share a dozen oysters, a pound of peel and eat shrimp, a serving of Louisiana fried shrimp and a few oyster shooters. The bill was around $57 before tip…not too bad I thought! Then we hit a cab because our next stop is a very important one for the day: The Clark County Courthouse for our Marriage License! Until we arrived I had forgotten the O.J. trial was still going on, talk about a circus. We filled out our forms, paid our $55 and had no problem getting our license. From there we decide to walk to The Four Queens since I had a coupon for free slot play. I sign up for their royal players club and get my free slot play…only I decide my fiancÃ©e would probably enjoy it more so I give it to her to enjoy while my parents and I sit at the bar, play more video poker, watch MNF and drink a few more beers. After getting bored of video poker (finished down a few dollars) I wander over to the craps table where I proceed to win around $50. I look into half price tickets to “The Rat Pack is Back” (I’ve seen it several times but thought my parents would enjoy it, only after discussing it with everyone we decide tonight is all about one thing only: drinking, gambling and casino hopping! Before leaving I drag my fiancÃ©e over to the table to teach her how to play craps, so I spot her some gambling money and away we go! She finishes up $30 and I finish up around $75! From there it is off to The Golden Gate for shrimp cocktails. Only we see the line is longer than our patience and decide to instead sit and drink some more beers. Still feeling the need to roll the dice I hit the Golden Gate’s craps table and walk away up around $60. The parents and the fiancÃ© are starting to get itchy to get back to The Flamingo but I convince them we have one more stop: The Plaza! A quick cab ride back and the decision is made to grab a bite to eat before calling it a night. I have a $10 food voucher at Bill’s so we decide to order a round of french dips. While we wait for a table in the diner I hit Bill’s craps table real quick…and lose a quick $50. But I finish up for the day around $220 and for a low roller like me that isn’t too bad! I quickly realize my food voucher isn’t valid until November 1st…oops! After about two bites of my sandwich I start to drowse off and realize I need bed NOW! So I excuse myself and head back to the room where my fiancÃ©e quickly joins me and our first night in Vegas comes to snoring end. I wake up bright and early at 7am and go for a mile jog (I need to fit into my suit for the wedding!) I place money on the White Sox to win their one game playoff against the Twins and then I hit the spa at The Flamingo. I really enjoy a good steam bath and sauna while on vacation, especially when consuming much alcohol and smoking mucho cigars. I clean up and head up to the room to wake up my fiancÃ©e. We throw on our bathing suits and go down to the pool for some sun and bloody maries. After a short stay poolside, we get cleaned up because today is a big day for both of us, we had decided months ago to treat my mother and father each to a very unique and special day designed specifically for each of them. We find them at “Bugsy’s Bar” (which would quickly become our central meeting spot throughout the week. I think I won $80 at this time and that was my only win at video poker for the week). My fiancÃ©e takes my mom off for her day while I take dad off for his. We shared an appetizer platter (with some name like the Brickyard Special or something along those lines) and a few beers. It was round this time my fiancÃ©e called to say her daughter (my soon to be step-daughter) had taken my fiancÃ©es car to school (she has no license and obviously uninsured) because she was “running late for class.” You can probably guess what happened, she rear ended a dump truck and severe front damage was done to the car. People, this is why you go to drivers-ed and earn your license! If you don’t know how to drive then don’t drive! It’s also why YOU DON’T STEAL YOUR MOTHER’S CAR WITHOUT PERMISSION!!!!!!!! Needless to say both my fiancÃ©e and I are pissed and this puts a big damper on the rest of our trip as we now must deal with insurance agents and whatnot. The daughter is also supposed to fly out on Friday in time for the wedding. So a decision must be made if we will still allow her to come out. But back to our day; trying to not let our daughter’s mishap ruin things, after lunch I played some craps at the Sahara and win a quick $50…only to lose that right back at the blackjack table. We take the monorail back to The Flamingo and decide to take a nap before meeting up with the girls. Meanwhile let us all hear about mom’s special day! The day begins with my fiancÃ©e and my mom taking a shuttle to the Liberace museum (they were obsessed with going) I didn’t get the details but I assumed they looked at lots of rhinestone encrusted thingies. They then took the shuttle back and headed over to The Bellagio for a bite to eat and some drinks. From there they attended The Fab Four Live show at the V Theater (I had purchased half price tickets from goldstar a few weeks prior). Mom is a big Beatles fan and even attended one of their last concerts ever at the old Seattle Coliseum way back in 1967. They had a great time and mom danced and sang to all the songs. She did say the guy who played Paul was the best of the four. Post show we all met up inside the Planet Hollywood Casino and mosied on up to the bar for more video poker and beers (well, white wine for my lady). We had a really friendly bartender (can’t remember his name to save my life though) and a good time was had by all four of us. The decision was then made that since this was a Beatles day for mom we should take her to The Revolution Lounge for a drink and some more Beatles inspired fun…after our cab ride over we find out that they are closed on Tuesdays, “D’OH!” So instead we walked across the street to Casino Royale for $1 Michelob’s and cheap craps. My fiancÃ©e lasted a whole 15 minutes before deciding it was bed time and snuck off back to the room. My parents and I stayed and I made around $100 before they wanted to call it a night themselves. I walked them back to the hotel and I collect my winnings on the White Sox game and then decided to hit the craps table at Bill’s. I lost a quick $50 and figure I need food. Ellis Island here I come! Only I didn’t get that far. I decide on the way to grab a quick beer at the Stage Door Casino and realize I‘m not feeling so hot. I get back to the room with urgency in time to vomit in our lovely Go room bathroom. Well, it is Vegas! Off to bed I go for day three! I wake up a wee bit worse for wear. I assume at first it is just a good old fashioned hangover and pushing through it should be no problem, I would just need to avoid any alcohol until later that evening. My fiancÃ©e and I have an agenda for the day: we need to get items for the wedding reception as well as gifts for our bridesmaids and groomsmen and most importantly…my wedding ring (hers was purchased far in advance and is lovely) and we decided it would be a fun story if we shopped for a ring at Las Vegas’ many fine pawn shops. I mean, who knows what stories the ring could tell about its previous owner? We catch The Deuce back to the Flamingo where I decide I must take a nap. We have friends coming in that night for dinner at Bouchon and at the rate I’m going it’s going to be a sad meal. I wake up and clean myself up. The nap has helped a little but any sudden movements and the nausea kicks in again. The first 5 wedding guests arrive that night, including my best woman! One of my other groomsmen who also arrived that night brings the gift that keeps on giving: an adorable case of Romeo y Julietas cigars! Many hugs are exchanged and off we go for drinks at the Palazzo. Oh, how our night would have been different if we had chosen any other casino to go for a drink. Sitting down in a lounge in the casino we order a bottle of champagne as well as various other cocktails. I order an old fashioned for myself, thinking the bitters would ease my stomach pains. It didn’t. The waitress brings us a snack of olives and some sort of wasabi covered nut. One of our wedding guests eats about three and gets a scared look on his face, “what’s in these?” he asked the waitress in a panic. “They are wasabi peanuts!” she states. Oh crap. Our friend has severe peanut allergies. He quickly runs to take Benadryl and pray for the best. It doesn’t help and the hotel medic is called. They decide he can’t take an epi-shot because he already took so many Benadryl and the EMT’s are called in to monitor his progress. Luckily he was okay, but done for the night. So he and his girlfriend retire back to his room far earlier than planned. Suddenly my stomach ache doesn’t seem such a big deal! The Palazzo to their credit comped our entire bar tab (probably exceeded $125). Then we are off to Bouchon for dinner. So I slept for a few hours with a cold washcloth on my face and was awoken by a phone call from my fiancÃ©e “how are you feeling?” “Better I guess.” “Good enough to come back downstairs for a bit?” “I’ll try.” So I met back up with everyone and took everyone over to the IP so they could see the dealertainers first hand. The Pat Benatar was passable enough. We then hopped over to Bill’s where I was going to try and play some craps but realized I needed to get back to bed and left my friends to explore the night. I wake up feeling only slightly better, but my fiancÃ©e and I have more work to do today. Today’s mission is to find serving trays and utensils for our reception. Before we head out we stop at the Tropical Breeze CafÃ© for a bite with my parents. I can only get down toast and some cottage cheese. My fiancÃ© and I then hit every nook and cranny on the strip between The Flamingo and MGM Grand. We have no luck finding the right toasting glasses but we do find a lovely tray, napkins and serving plates at a gift shop inside The Paris. Since we were engaged in Paris it made sense to go with a Parisian theme. We then hit the ABC store to buy alcohol. I buy a few hundred dollars worth of whiskey, vodka, tequila, gin and mixers. We then hit the Stage Door Store so I can buy mucho beer. At Walgreens we buy plates, utensils and cups. I make a quick $20 bet on the money line on the white sox (would have paid out $50) and threw some money down on the cubs as well. *They* then hit ROK before heading over to the Monte Carlo Brewpub for our meet and greet. *We* finish watching the debate and walk ourselves over to Monte Carlo. On the way in we noticed the MC had $5 craps tables open. So I decide to give a good friend a quick lesson. We both color up about even and smoke a quick cigar before heading into the brewpub. It was a lot of fun already having so many friends and family there. We all shared one of the GIANT dispensers of beer and I ate a pizza. I should also note this was the first time in two days I could eat any sort of solid food and while I only managed one slice it was something my stomach really needed. We watched the cubs and white sox both lose, thus losing my sports bets for the day before deciding to break up into packs. One group just wants to call it an early night and head back to The Flamingo (most everyone was staying there or IP) while a few brave souls crave craps. The combination of finally feeling like I didn’t need to vomit every 5 minutes, combined with friends and the free flowing beer got me going on into our journey into the night! First stop: Excalibur! Now this is far from my favorite place to go but they did have an open $5 craps game going on so we couldn’t resist. Four of us slid up and started to play. I noticed next to us were two gentlemen who felt the need to consistently bet the Don’t Pass and Don’t Come lines. Of course you know that this…means…war. Between the four of us we all rolled so hot it didn’t take long to kick them off the table and when we finally colored up we were all up a decent amount. I think I left there up around $100 when I finally sevened out and we decided a change of scenery was due. So off to Tropicana we went! I wasn’t feeling it and finished there about $100 down. Easy come, easy go! I waited for everyone else to lose before we paid a private SUV driver to take the 6 of us back to our neck of the woods. Half the party went to bed while 3 of us went to IP to play craps there and we won back what we had lost at Tropicana. Our third called it a night while the remaining two of us crawled over to Casino Royale (and at this point we were close to crawling). We played fast and furious there for a few hours when the second to last man standing realized it was almost 5 and he needed sleep. So I made one last stop at O’Sheas where I had another hot roll before finally realizing its 7am, I haven’t been feeling well and I would probably pay for this in the morning. When I snuck into the hotel room my fiancÃ©e asked how much I lost…so I said “well, let’s check my wallet!” Counting out the bills we realized…I was up $700 for the night! Woo HOO! Snug in the thought I had finally shaken my illness for at least one night and had a rocking good evening (and morning) out in Vegas I fell fast asleep. Waking up far too early and knowing my fiancÃ©e had already run off to have breakfast with friends I dragged myself down to the pool for some rest and sun. It is here I get a huge ego boost. A group of lovely women lounging next to me start chatting me up and one finally asked what my plans were for the night and would I be up for something? “Sorry, I can’t…tonight is my bachelor party. I’m getting married tomorrow.” Strangely enough they had no time for me after I said that. Trust me though, after a few days of lying next to the toilet dry-heaving I needed that. Anyways, more good friends arrive into town and we hang out and have a few bloody maries together. My best woman and a few other friends decide their mission that day would be to find us our toasting glasses. I get a call later saying they found us the perfect glasses: an elegant crystal wine glass for my lady (she loves wine) and an Elvis themed pilsner glass for me (I love the beer) so with that out of the way I can actually relax again! I take a nap knowing I have a long night ahead of me. Waking up early evening I started to clean myself up. I then step out of the shower to be surprised to see my soon to be step-son entering our room (thankfully I was covered with a towel). More family arrived (including the daughter who we decided we would regret not having her at our wedding no matter how stupid she had been) when the daughter arrived I looked at her and said “Right now I’m going to hug you and I want you to enjoy your trip. But when I get back we will discuss what you did. Ok?” And finally by Friday night everyone who was coming to our wedding had arrived! FYI: Total guest list numbered around 52 people! Thankfully no photos exist from the bachelor party. He knew exactly where to go: The Office Bar. This place is truly a dive, but damn it all a dive with heart! One of my good friends took advantage of the opportunity to ask the bartender for “15 shots of jagermeister!” “I’ve always wanted to say that!” he later said. We shot some pool, played some video poker, listened to some honky-tonk and then loaded back up into the bus and hit our dinner destination: The Redwood Bar and Grill. I should probably apologize to the staff and other patrons there for subjecting you to 15 drunken idiots. I ordered the porterhouse special ($17.99!) and tipped the piano player $20 to keep the Sinatra songs coming. After dinner my dad and I belted out the worst rendition of New York, New York ever. Good times. We then cruised downtown before stumbling into Binion’s for craps. I don’t think I did well there. Not that I can really remember much from this point on. We did stop and watch a few light shows and my friends did make me pose for a caricature drawing. We then hit El Cortez for more craps. I think I lost money here as well. But I did hit a hard 4 by getting the entire table to chant the name of my fiancÃ©e “Lorri! Lorri! Lorri!” It was here about half the party split to meet up with the girls (the plan had been at 1am to have both parties meet up at Carnival Court for a few more drinks and coed dancing. I however, had other plans. ‘Who wants to play cheap blackjack at The Western?? ?” I cried out “Oh, but a warning: this place isn’t for the faint of heart.” A group of 5 tagged along with me where we played $3 blackjack for the next hour before finally hailing a pair of cabs and making our way to Harrah’s. My fiancÃ© was long in bed and the rest of the girls had instead gone to Toby Keith’s joint. I refused to set foot in there and instead a group of us made to Bill’s for one last round of craps before I wandered off to grab some burger king and crashed in the extra bed of one my groomsmen at The IP (the fiancÃ© and I decided to go traditional and spent the night apart). Day 6: October 4th 2008 THE WEDDING DAY! I woke up at 10am, knowing I had to get back to Flamingo in time to request an early check in for our wedding night suite. After much consideration we had decided our best bet for our reception would be to book a Cosmopolitan Suite at The Flamingo. It was relatively inexpensive ($450 for the night, much cheaper than trying to book a reception hall or private room at any restaurant) and could easily fit all of our guests for drinks, snacks and cake. Another long wait at the check-in desk and I was suddenly in possession of the key to the suite. WOW! It was amazing 900 square feet, two Huge HDTV’s (one in the living area and one in the bedroom) an amazing view of the mountains in the distance, jetted tub, awesome shower, plenty of seating for our guests. Good call says I! I quickly sneak off to grab 5 $25 chips (our gifts to the wedding party were the Vegas shot glasses we previously bought each filled with a casino chip to spend however they so wished). The best woman and one of the bridesmaids took off to get a rental car so that they could pick up the cake (from cake designs las vegas, HIGHLY RECCOMMENDED!) and snack items at Trader Joes (cheeses, crackers, salami, olives, cornichons, etc). My groomsmen and I proceeded to bring up from our other room all the serving trays, glassware, booze and various other reception needs. We rested and watched college football while the bridal party had their toes, hair and make-up done. Once the cake and food arrived we finished prepping the suite for the reception. Around this time my stomach issues returned. I took a nap hoping to recover in time for the wedding but I had no luck. I spent the rest of the evening not feeling well. But the wedding must go on! The groomsmen and I cleaned up and got dressed and took off for the chapel. 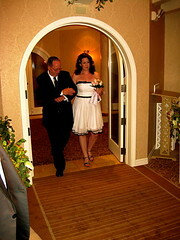 We were wed in the Garden Chapel at The Flamingo. The staff did an amazing job. The minster was outstanding. He took time to work with Lorri and myself pre-ceremony to personalize the things and despite only spending a few minutes with each of us separate it seemed he knew our entire life story and wove it into his service. The music and the flowers were perfect! When the bride entered on the arms of my father (her father passed away two years ago and she truly does think of my father as her own and he considers her a daughter) there wasn’t a dry eye in the house. 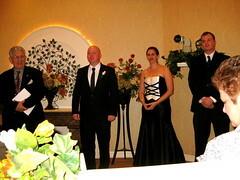 The ceremony was touching and humorous and went off without a hitch. Post ceremony we spent 20 minutes with our photographer taking pictures of the wedding party and then photos of just Lorri and I. Then off to the suite for the reception! I’ll spare the details but drinks were had, many very touching toasts were made, people laughed, people cried and a great time was had. I can’t tell you how amazing it is to have so many people commit to flying out to the desert for your wedding. It makes one feel special (I blame it all on my wife for being so gosh darn sweet and lovely). Finally we shooed everyone away and the wife and I enjoyed our suite to its fullest extent (despite my stomach pains I was determined not to let such great digs go to waste). We woke up at a very leisurely pace and checked out of our suite. I considered putting money down on my Seahawks…but THANKFULLY reconsidered (44-6, ouch). Turned in our wedding package receipt to the Total Rewards desk; we spent enough I would hope we see some sort of good return down the road. We then said goodbye to the few remaining guests, especially my parents. It was a very special week for my wife, my parents and I. They have really taken to my wife and her to them. I better not screw this one up! I got the scoop on what the rest of the guest did after leaving the reception the night before. Many couples went out for a romantic dinner, most (led by the best woman) went and sang karaoke at The IP. Still with an ill stomach I decided I need pho. So we made our way to The Grand Wok at the MGM Grand. I managed to down half my bowl before deciding any more would overdo it. We took a taxi back to The Flamingo and took a nap. It was during the nap that we overslept and nearly missed our appointment with the wedding photographer to pick out the photos for our package. Luckily we made it just in time and grabbed our wedding photos and DVD. Another short nap and then somehow the combination of pho and sleep cured my stomach. Felling 100% better we agreed to spend our last night out having dinner, drinks and some final gambling. We grabbed a few burgers at BLT at The Mirage. We shared the Shaft and the BLT. We both preferred the Shaft. It was good…but a little overpriced if you ask me. It was then that we got a phone call from a wedding guest (with his girlfriend) who had been bumped from his plane. Despite wanting an evening alone we decided it would be rude to not say “hi” at least. Turns out they were nearby wanting to watch the Siren’s of T.I. show (ugh) so we met up with them. We then went to O’Sheas for some more craps playing while the ladies played slots. I finished up just barely (around $12) and the other couple departed in search of food. Lorri and walked along the strip and went back up to the room to eat leftover wedding cake and watch the wedding DVD. She was tired and wanted to sleep but I needed one last night out on the town. Fearing I would blow my winnings, she made me promise to only take with me $100 for my adventure out. I walked down the strip past Bellagio, through The Monte Carlo, through NYNY, through Excalibur over to Tropicana. During this walk I remembered why I love this city so much: the lights, the sounds and the people. It had been a long week and between exhaustion and being ill much of the time, I was starting to doubt my need to ever return. But one walk and I knew I would be back. Well, one thing nearly ruined that feel good feeling: I stopped into “The Trop” and dropped $80 in about 4 seconds at craps. Leaving me with a scant $20 I trudged back and turned that $20 into $60 at Bill’s…which I then turned into $30…sigh. But I did meet some nice people while there. Not quite finished I went back to O’sheas for one last roll and somehow managed to build that $30 back up to $170! All it takes it one hot roll! Finally feeling good about my time in Vegas I called it a night. Anyways, thanks for reading all this! It may be awhile but I can’t wait for my next trip to LAS VEGAS! Wonderful post! Congrats on your wedding. You make a very cute couple. Hope to read more....especially how the daughter talked her way out the "borrowing the car incident". This has to be one of my favorite trip reports.. 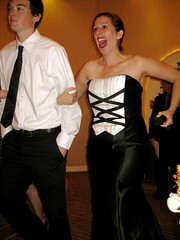 I love all the fun you guys had ..
My son is getting married at the belagio (sp?) next june I hope it goes as well.. Very Nice Slacktion ! I think you had those pre-wedding jitters...Congratulations on your marriage..
We had two out with stomach and/or intestinal distress during our get together that happened just a few days ahead of yours. So there could be some kind of bug going around in Vegas. AWESOME AND CONGRATS!!!!! VEGAS WEDDINGS ARE THE WAY TO GO!!!! great report - thanks for taking the time to do it. sounds like a well planned and executed week.. with enough spare time for plenty of fun too. congrats to the pair of you. Thanks for sharing and CONGRATS!! Nice TR! Congrats on your wedding. CONGRATULATIONS! And thanks for a fantastic trip report. Thanks to everyone who has responded! The daughter got an ear full from both myself and her mom. Then it was agreed she would work to pay off the damage AND STAY AWAY FROM THE CAR UNTIL SHE GETS A LICENSE AND PERMISSION!!! !